I sent my baby to kindergarten. Everyday I’m amazed at how fast she’s learning and growing up. I took on more responsibility in my day job. Some of it has involved defending for things I believe in, occasionally loudly, which really isn’t in my nature, so I’m proud of myself for being able to speak up. I got to meet my lovely agent in person, which was completely delightful. I’m blessed to have such a caring advocate in my corner. I went to New York 4 times, in three different seasons. It remains one of my favorite places in the whole world. I started listening to audiobooks. It seems small but having a little bit of time to myself on my commute to add in “bonus” books has been really fun. I joined RWA and my local chapter, WRW. Both organizations have been helpful and also rejuvenating. I look forward to their newsletters in my inbox and to attending monthly meetings to learn about craft. Plus, the fellowship is excellent. I completed a new book, start to finish, that is shiny and fun and I love it. I hope it gets it’s chance to go out into the world. I entered said book in a handful of contests (and finaled in one!) and have found the kind feedback of experienced authors to be very enlightening. I won NaNoWriMo for the fourth time. That book hasn’t been touched since Nov. 30, but I plan to finish it up soon. I generated a number of new ideas and plan to try something totally new for me with my next project, which is exciting and scary. I read 61 new books. That’s half my total from the previous year, but it makes sense, given everything else that’s been going on with my time. I’ll aim for a similar number for 2016. I made new and continued ongoing friendships with wonderful writing community friends. This is most definitely not a solitary endeavor and I love having so many hands to hold as we walk along this road together. 2016 is going to be full of even more accomplishments and surprises and gifts. Cheers to a new year and thank you to everyone who made 2015 amazing! 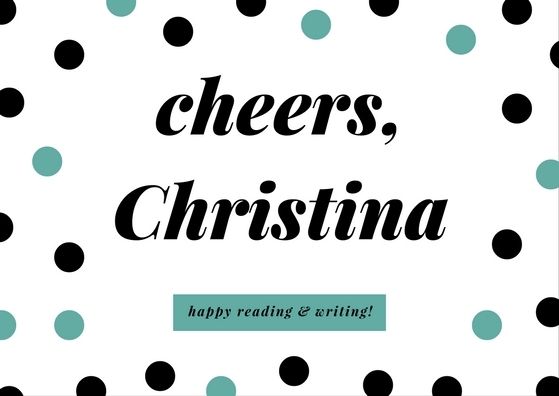 You had a fantastic year, Christina- I hope 2016 is even better! I never thought I’d be a New York kind of gal (and I would have to be super rich to actually live there in the style I’d like to get accustomed to), but it’s my favorite city on earth too- and I probably still wouldn’t have gone there if it weren’t for books and blogging. I am so excited for you and all the publishing world has in store for your books! I hope your 2016 is even better- I can’t wait to buy your book (and of course have you sign it! )!